Purple has long been the color of royalty. 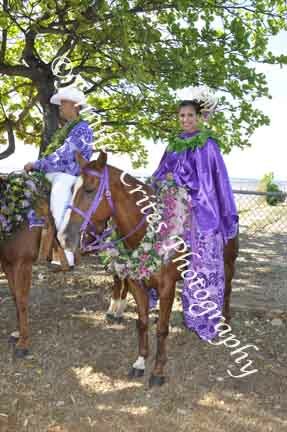 But in the Aloha Festivals Parade, purple is the color representing the island of Kauai. 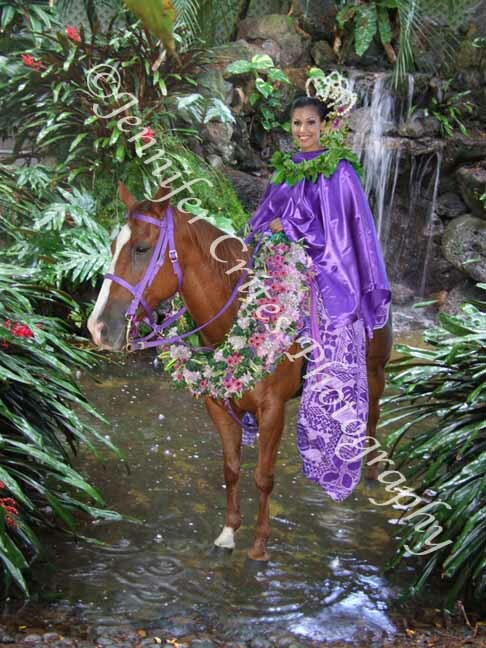 I used Photoshop to transport this lovely Kauai princess and her horse from the patchy sunlight at Ala Moana Park on Oahu, where they waited their turn to enter the parade, to a waterfall-fed grotto on the North Shore. The pa’u outfit was originally developed as a cover so that Hawaiian women could keep their clothes clean while riding to their destinations. Turkey is full of surprises. For example, it is commonly believed that tulips originated in Holland. In fact, tulips are native to Central Asia and Turkey. It seems that in the 16th century, someone brought them from Turkey to Holland where they became wildly popular. In Turkey, under the reign of Sultan Ahmed III, the period between 1718 and 1730 became known as the Tulip Era—an era of peace in which handmade textiles, embroidery, carpets, clothing and other objects were adorned with tulip designs and large tulip gardens sprang up around the Golden Horn in Istanbul. 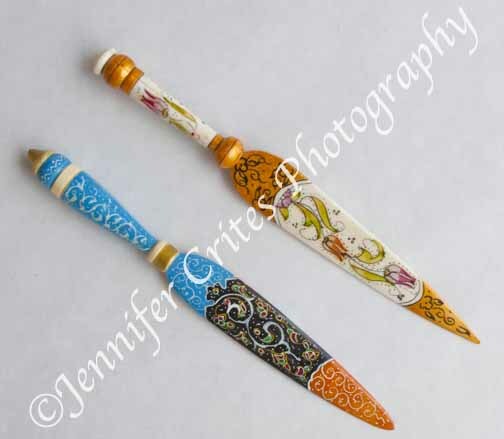 When the sultan was dethroned, the Tulip Era came to an end, but tulip gardens can still be found in Istanbul, and the lovely designs still adorn many handmade goods (see photo below). 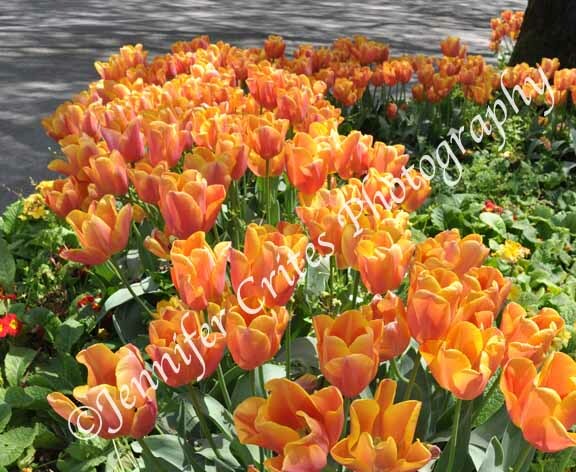 The botanical name for tulips, Tulipa, is derived from the Turkish word “tulbend,” meaning turban, which the flower resembles. The tulip is considered the king of bulbs and is Turkey’s national flower. They’re beautiful. They’re beguiling. They have cachet. They’re well made. They’re easy to clean. They’re hard to resist. You want one, but they’re not cheap. 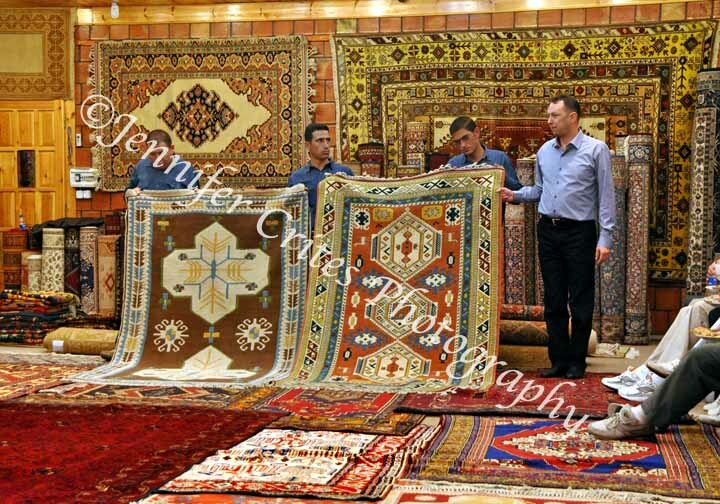 The sales staff brings you tea and goodies to eat as the head salesman extolls the virtues of his carpets, and his assistants roll them out one by one. Ouch! Double Ouch! I’m the original tenderfoot, and walking barefoot over little ridges feels like walking on a bed of nails. But the sign said, “remove your shoes,” so I knew resistance was futile, especially since management had conveniently made available plastic bags as shoe carry totes. A short distance to go over the ridged and wet terrain, and I knew the end result would be worth it. 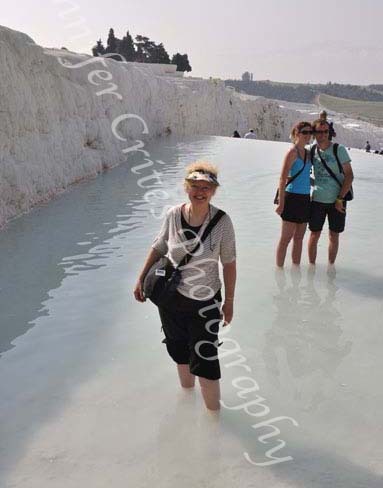 I was at Pamukkale (pronounced Pah-MOOOK-kah-lay), where calcium-rich water oozes over a cliff and forms lovely white-terraced pools. 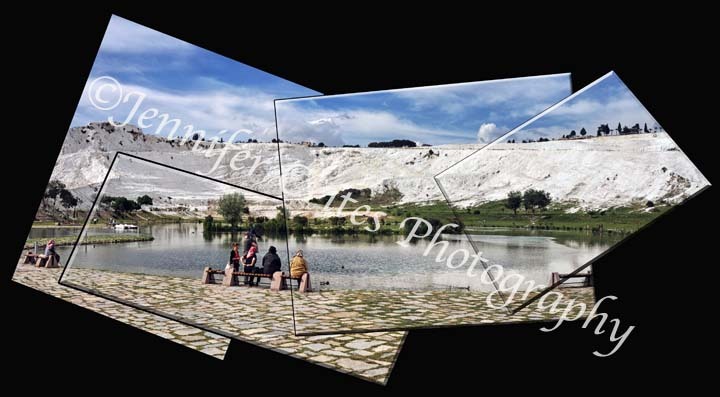 At one time visitors could climb down to the lower pools and soak in the mineral waters, but no more. To keep hoards of tourists from damaging them, the lower pools are closed to bathing. But all is not lost. 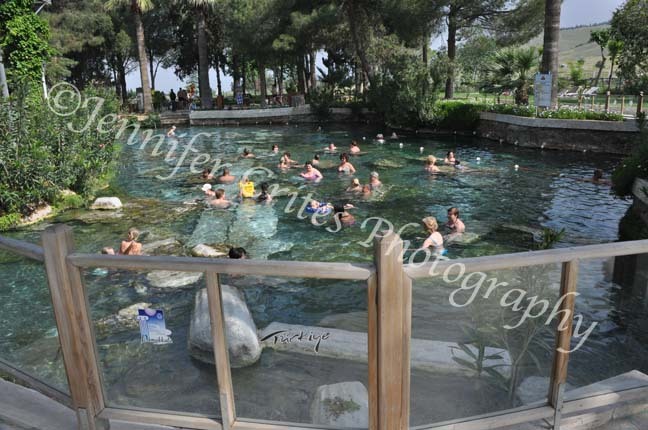 Travelers can still try out the healing properties of Pamukkale’s springs. One way is to patronize the spa. Pamukkale has been home to a spa since the Romans built the city of Hierapolis around the sacred, volcanically warmed spring (once you buy your ticket you can visit both the terraces and the extensive ruins of Hierapolis). I didn’t check out all the options at the spa, but I found Cleopatra’s Bath (featuring underwater seating designed as broken and tumbled columns) and two rows of aquarium tanks. Sit on a bench above a tank, immerse your feet, and dozens of itty-bitty cleaner wrasses will relieve you of dead skin and any ectoparasites they can find. It’s their job. And their food supply. One kind gentleman agreed to let me photograph his feet. The other way is to do what I was doing—gingerly picking my barefoot way over to one of the calf-deep pools on the plateau at the top of the cliff, relieving my feet at little tidepools along the way. I must admit, the warm water felt indescribably good, and whether it was the comfort of the smooth-bottomed pool, or whether the healing waters were actually performing their magic, I won’t ever know. But afterwards, my nagging headcold disappeared. I leave it to you to draw your own conclusions. It was the cutest thing I had ever seen. A baby goose—a gosling—nestled in the pocket of a teenager’s shirt. I had been visiting friends in the town of Penticton, Canada, a beautiful place surrounded by mountains and lakes. Their outdoorsman son had found an abandoned goose egg and brought it home. He kept it warm, and within days, the shell cracked and a fluffy little gosling emerged. For the chick, it was love at first sight. Thinking the boy, Craig, was its mother, the little goose attached itself to him. Outside, Craig carried the gosling everywhere in his shirt pocket. Indoors, it had the run of the house, its webbed feet padding after him wherever he went. The gosling also accepted the rest of us as fellow geese, showing no reluctance to approach us. I held the tiny creature in my hands, felt its little feet in my palms, the softness of downy feathers, and I was captivated. We enjoyed watching our new baby waddle through the garden, nibbling small flower heads with its tiny beak. 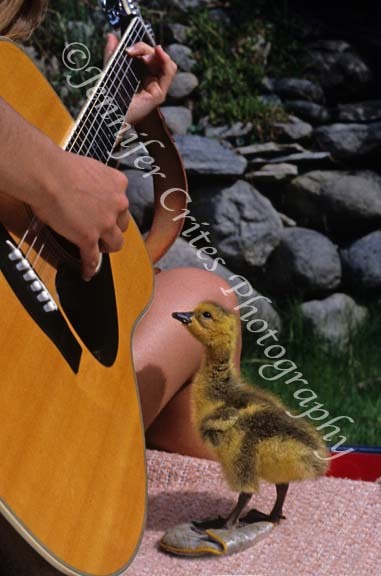 When Craig’s sister played her guitar, the gosling positioned itself within inches of the strings, listening intently and watching her hands pluck and strum. But Craig knew the adorable little bird didn’t belong in a human environment. He had seen a mother goose and her new hatchlings in the area where he had found the egg and felt sure this was the baby’s mother, so he made a plan, hoping she would recognize and accept her own. Since I had become as attached as he, Craig took me with him. Together we paddled his canoe across the mountain lake, the little bird rustling around in his shirt pocket. When we spotted the mother goose and her brood near the shore, we drifted as close as possible without alarming them, then placed our charge in the water and started paddling away. The gosling followed us, its paddle-like feet working overtime. Realizing this wasn’t going to be easy, I plucked it out of the water while Craig maneuvered the canoe back to our original drop point. This time, after setting the little goose back in the water, we each grabbed a paddle and jettisoned away as fast as possible. The gosling followed once again, honking in desperation. I could hear the distress in its little voice. It broke my heart. I could feel tears welling up, the salty drops trickling down my face. I begged Craig to turn around or let it catch up, but he was resolute. And, as it turned out, he was right not to stop. Finally we had pulled far enough away. Our little bird stopped swimming. It sat in the water, watching us. It must have realized it couldn’t catch up. Then an amazing thing happened. The mother goose and her brood glided out of the shallows gently honking at the stranger. In response, the gosling turned and swam towards them. After a brief introduction and some nuzzling—perhaps a goose way of checking I.D.—the whole group glided back to the shore, our gosling among them. I was sad and overjoyed at the same time. I would miss the little Canada goose, but it was with its family, back in the wild where it belonged. 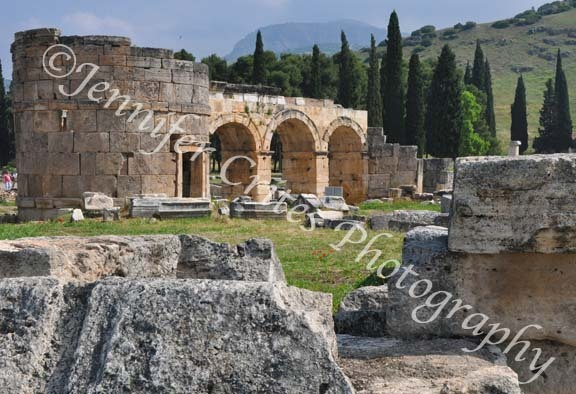 Where in the world is this ancient community dwelling (interspersed with Christian churches)? If you know, please share your story and your thoughts about this place: How and when did you come to be there? 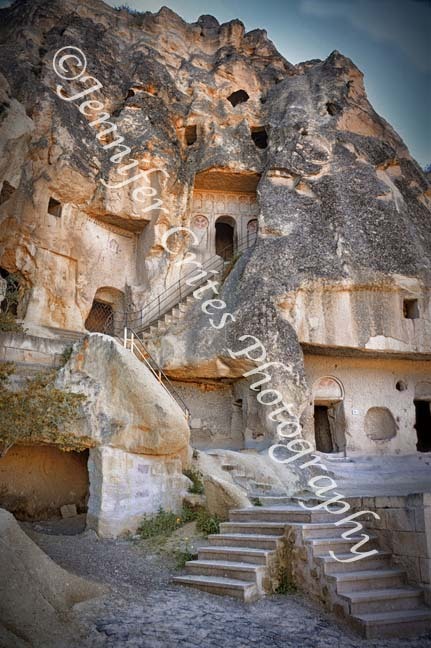 It’s in an ancient land where people lived above and below the ground. Once the people embraced Christianity, but no more. Most days, a flotilla of hot-air balloons hovers above the landscape. You will see an occasional camel, which you can sit on and have your picture taken. Shop for intricately decorated ceramics, leather coats, and carpets. My sincere apologies to all of you who have been following my blog, waiting for new posts and responses to your comments, and wondering why you’ve not heard a peep out of me in three weeks. As it turns out, I had an opportunity to go on a very last-minute trip—a cruise along the west coast of Norway and a few other spots, but mostly Norway. Internet service on the ship was spotty at best, and there was virtually no time to find and use Internet facilities on shore. I just got back a few hours ago bearing photos, stories and a certificate proclaiming my crossing of the 66th parallel north—into the Arctic Circle, land of the midnight sun. Needless to say, I’m anxious to share and will do so as soon as I’ve sorted myself out and claimed some much-needed sleep. In the meantime, I hope you’ll enjoy the Aloha Festivals’ pa’u rider (before and after) and a few other photo posts (coming in the next few days) I prepared just before I left, in the hopes I could stay in communication while gone. September in Hawaii is Aloha Festivals time, a highlight of which is the Aloha Festivals parade. Nothing could be more fun and colorful to photograph than a Hawaiian-style parade with its flower-bedecked floats. 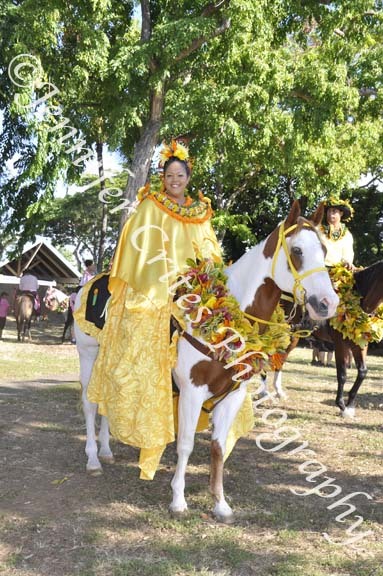 And a welcome inclusion in every cultural parade is the pa’u rider. 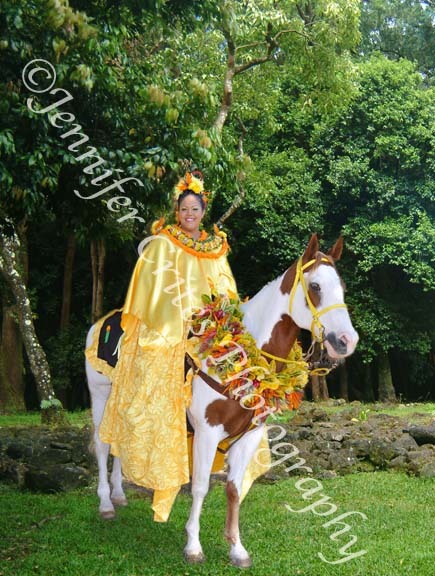 Each island chooses a pa’u queen and court, all wearing the colors of their particular island. Gold represents the island of Oahu. Before the parade, all the participants gather at Ala Moana Beach Park to wait their turn. I found the pa’u riders under the shade trees, but since the lighting and setting were a shade less than pretty, I decided to remedy that by transporting each one to a new location via the magic of Photoshop, a process that can take 2-3 hours in the digital darkroom. But it was worth the effort. The Oahu queen here looks much more regal in the soft lighting of the Nu’uanu rainforest.